NOTE: This page is under a new domain (mine!) and not all links and images are uploaded yet. I will one by one upload and update. "Sputnik Declassified" was premiered in November 2007 on most PBS stations. Please visit http://www.pbs.org/wgbh/nova/schedule-local.html. And for more Sputnik features, visit companion Web site, http://www.pbs.org/wgbh/nova/sputnik/. What does it all mean 50 years after Sputnik? We have ISS with Americans and Russians as regular space partners (not sure how long this will last with re-establishments of missile and bomber systems aimed at each other). However as quoted on slashdot.org, "In Soviet Russia, Sputnik launches US Space Program!" It's been a really long time ("billions and billions...") since I have checked the following links or updated this page. Sorry some the links are dead but I have found a collection of links, including the NY Times that has the actual front page headlines of the Sputnik news and events in October 1957. For this and other links click here. This website was created for the 40th commemoration of the beginning of the Space Age. Contributions and corrections are most welcome. I admit there are some sweeping overgeneralizations in this page and I'm not attempting to have an accurate word-for-word historical account of these events. For those of you with "older" browsers from 20th century, you should see the "blinking" words, an html feature that made it in Netscape 1.0 because they ran out of beer (according to Laura Lemay). The Russians launched the first artificial satellite from the Baikonur cosmodrome in Kazakhstan which demonstrated the technological superiority of Communism (actually more of a propaganda pain for the US). They equipped the Sputnik with transmitters to broadcast on frequencies at 20 and 40 MHz so everyone will know it's up there. The United States was shocked. Senator Lyndon Johnson said the Russians have jumped way ahead of us in the conquest of space. "Soon, they will be dropping bombs on us from space like kids dropping rocks onto cars from freeway overpasses! *" [*from a movie that dramatized the emotional impact of that day]. Everyone in the United States were constantly reminded that the Russians were well on the way in conquering space and newspaper headlines, "REDS ORBIT ARTIFICIAL MOON" and "SOVIET SATELLITE CIRCLES GLOBE EVERY 90 MINUTES". Many people did not know how to think of a satellite in orbit. It was too mysterious for them, "What is a 184 pound object in orbit?" "Are they looking down at us?" Engineering colleges were flooded with new students the following quarter. It was as if everyone was "joining the army" to take on the Russians in the New Frontier (the govt also provided a lot of funds for engineering schools to fuel new interests in engineering). Everyone on Johnston Island in the Pacific were issued sidearms to carry at all times. Johnston Island is so small it only has room for a runway and a hanger for airplanes. Students at Case Institute immediately became "Rocket Scientists" and stayed up many late nights discussing various methods of space travel. Jim Dawsons, science writer for the Star Tribune, wrote about how his third grade teacher was very nervous at the time. His school at Omaha, Neb., was just a few miles from the Air Force's Strategic Air Command headquarters. A fleet of F-100 fighters appeared in the sky coming right for the school. "MiGs!" the teacher shrieked. "MiGs!" She ran, hysterical, from the classroom, convinced they were about to be nuked by Russian fighter jets. The kids, mostly Air Force brats, ran to the windows to admire the F-100s, the coolest jet of its day. Politicians and editorialists began attacking the U.S. educational system for having fallen behind Soviet schools in training people in the sciences and other fields. Former President Harry Truman was moved to comment, charging the "persecution" of prominent U.S. scientists by Sen. Joseph McCarthy during the early 1950s had been a setback to the nation's development of satellites and rockets. Ross Perot became inspired by the Sputnik to create an electronics dynasty. After observing Sputnik, seven year old Franklin Chang-Dìaz of Costa Rica became infatuated with space travel and eventually became a NASA astronaut. Tom A. posted on the newsgroup about an American entreprenuer had a "Sputnik" gumball for sale at the local candy store. It was blue and had protrusions sticking out of it to simulate Sputnik's antenna, and it was delicious. Rich Tweedie K6VKT (now a SK) as a high school junior was one of first ham radio operators to hear Sputnik before it was mentioned on American radio and TV news, though many others thought it was a hoax (for a first person account, see below). Students of St. Joe's High School radio club W8KTZ at http://sjhrc.org performed tracking of Sputnik satellites and provided infomation to media (from Bob Leskovec K8DTS). President Dwight Eisenhower was surprised but not as anxious as everyone else. He had photographs of the Russian launch facilities that were obtained from U2 flights over Soviet territory the United States was conducting since 1956. So immediately after the Sputnik launch President Eisenhower did not see it as an immediate military threat and he tried to lessen the political impact. But Eisenhower could not disclose intelligence gathered by the U2 flights, and he was not successful in damping the political impact. Thus the "Missile Gap" argument was born. The Sputnik launch occurred back in the days when the Pentium had vacuum tubes, and during this period the Americans and the Russians regarded each other as enemies (also known as the "Cold War"). They built massive armies, navies, and air forces and were prepared to engage in global war at a moments notice. American military manuals regarded the Russians as "The Threat," and Soviet government went as far as training many non-military citizens on use of small arms to prepare for an invasion from "The Imperialists." The United States tried to gain a foothold on the High Ground with the satellite Vanguard but it exploded on the launch pad and everyone laughed at the U.S. silly; some called it the "Kaputnik." And it wasn't as bad as just a launch failure, the vanguard satellite only the size of a grapefruit. The Sputnik 1 was 184 pounds and the Russians launched the previous month Sputnik 2 which was 1100 pounds and carried a live dog, Laika. There were lots of finger pointing, yelling, but also some had said that Sputnik didn't pose an immediate military threat. Although the same vehicle that can put a satellite into orbit can also vault a nuclear bomb across continents, nobody had solved the problem of shielding a satellite, or a warhead, during atmosphere re-entry. But it was that blasted "beep, beep, beep" every 90 minutes reminding the U.S., "Razzzzzz, we beat you!" Briefly, (very briefly), they weren't trying to beat the Russians, only trying to launch one and only one satellite. They also wanted to conduct one experiment successfully sometime during the International Geophysical Year (the 18-month "year" designated by scientists as January 1957 to July 1958). This was in the hot time of the Cold War, when both the Soviets and the US were trying to develop ICBMs and IRBMs, and Vanguard had NO military priority. The Vanguard team had to struggle and fight for money, range time at the Cape, buying equipment, etc. etc. The entire program was just 14 launch vehicles, and not all of those were "satellite launch vehicles." The big collapse of TV-3 in December 57 was a Test Vehicle, and the "grapefruit" satellite in its nosecone was kind of an afterthought: "Gee, if all the three stages work perfectly, as a bonus we could put a small satellite into orbit. So let's make a small one and try it." TV-3 was the FIRST attempt to launch the entire "stack." (Later, in the Apollo era, this kind of test came to be known honorably as "all-up systems engineering test"). The Vanguard I satellite, launched successfully on March 17, 1958 is now the oldest manufactured object in orbit. While it hasn't be actively transmitting for a good many years, it is in a highly stable orbit and will probably remain there for several hundred more years. Richard Easton has slides of a talk his father, Roger Easton, gave at the Linda Hall Library September 2007. He designed the Vanguard 1 satellite and the Minitrack System (and GPS!). However, a "war" on and the U.S. had to get SOMETHING in orbit and soon. Werner Von Braun and his rocket team finally got permission to launch the Explorer satellite and they successfully launch it on January 31, 1958. Explorer 1, a scientific satellite, used a rocket that had been developed to test guided missile components (also the same rocket later used as a IRBM placed in Turkey and aimed towards the Soviet Union). Explorer 1 carried an instrument package that provided evidence that the Earth is surrounded by intense bands of radiation, now called the Van Allen radiation belts. The U.S. could have put the first satellite in orbit in 1956 with a Jupiter rocket that reached 700 miles altitude and just 1000 mph short of orbital speed. However, those working with the launch vehicle were ordered to make sure the third stage was a dummy. President Eisenhower was nervous about the U2 flights over the Soviet Union and a U2 being shot down. That was one of the reasons he was reluctant to place a satellite in orbit because then it would have been another American object passing over the Soviet Union. Others in top government didn't want to embarrass anyone by putting the first satellite in orbit. Paul Dickson, author of "The Shock of the Century" heard a story of about the White House sent a team to Cape Canaveral in 1956 to make sure Medaris, von Braun and company did not send up an Army satellite. There were other conflicts as well. The three U.S. military services (Army, Navy, Air Force) each had their preference of how to deploy space vehicles thus wasted much time arguing among themselves [the Marines probably said it didn't matter which service leads the conquest of space, but it couldn't be done without an amphibious landing! Maybe this is why John Glenn was the most popular among the first astronauts]. In a Associated Press article by Greg Myre, Russian scientist Arkady Ostashev said, "Those were great days. It was a lot of fun." Ostashev was part of a handpicked team and he was responsible for testing the rockets used for launching Sputnik. 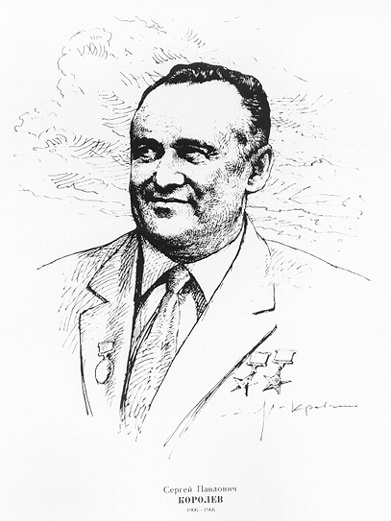 Sergei Korolev, father of the Soviet space program, told Ostashev and his colleagues after their triumph, "Congratulations, the road to the stars is now open." Although the Baikonur launch complex was so isolated that Ostashev and his colleagues, desperate for entertainment, would catch scorpions, put them in glass jars and watch them fight to the death. Sergei Korolev had to struggle with many in the Soviet government who thought satellites and men in space was a waste of time. While working the technical challenges, he also had many political challenges from those preventing him from getting the resources he needed for the space program he managed. For more information on this, read the excellent book about Sergei, "Korolev: How One Man Masterminded The Soviet Drive To Beat America To The Moon" (by James Harford, 1997, John Wiley & Sons). Created NASA as the single agency to mobilize U.S. resources to beat the Reds to the stars. Created the Advanced Research Projects Agency (ARPA). The purpose behind ARPA was to research new technologies that where too risky to the private industry. In 1969 they created the ARPAnet to research transfer protocols between computers across systems, the predecessor to the Internet. Passed the National Defense Education Act. Aerospace companies began a new engineer recruitment campaign: All you need is a pulse and a degree. United States and Great Britain realign as allies. Homer Hickam Jr. and his colleagues created the Big Creek Missile Agency in West Virginia in response to the Sputnik. For more information on a 1999 movie portrayal of this, see http://www.octobersky.com. "In 1957 while anxiously awaiting a successful launch of Vanguard I, I was listening to Radio Moscow on the evening of Oct. 4 and heard the original announcement to the world of Sputnik, the first successful space satellite. Listening on the 27MHz frequency announced on Radio Moscow, I heard the Beep, Beep, Beep that was heard around the world. It was not there at first and I had to listen for a while to get it, gradually building up then dying out. Thus I heard the actual Sputnik before it was even announced on American radio and TV news. Some thought it a hoax at the time but I knew better. Listening to the Beeps getting stronger then fading with a Doppler shift quite evident. 27 MHz was a strange choice of frequency, never figured out why the Russians chose it." From this point, space development really got underway. Both the Americans and Russians embarked on developing spaceships to carry humans. The U.S. decided to recruit a select few for this bold new frontier, Test Pilots: Rugged men (no girls allowed! ), dashing good looks, brains, and courage (willing to ride still-underdevelopment ICBM launch vehicles). "We'll beat 'em this time!" as many in the U.S. said when NASA presented their first seven astronauts. Then the next thing they knew Soviet Air Force Major Yuri Alekseyevich Gagarin became the first human to travel in space. And it wasn't just a suborbital flight as planned for first two flights of the Mercury astronauts (or those regularly practiced by X15 rocketplane pilots), but one full REAL orbit! (Yuri Gagarin webpage at http://www.kosmonaut.se/gagarin). In 1961, President Kennedy challenged the Russians in a race to the Moon. In 1969, the U.S. got there first and the Russians re-focused their efforts on permanent presence in space with a Space Station. However, things didn't go too well for both sides. The United States got themselves in a terrible jam in a country called Vietnam and had many social, economic, and political woes. They developed the Space Shuttle after the Apollo lunar transport system was decommissioned. Meanwhile, the Russians got embroiled in Afghanistan, which became "their Vietnam," and also suffered a deteriorating economic infrastructure. Forty years ago the reaction throughout the United States was universal: We're all gonna die. It's forty years later after that momentous date and what is the legacy of Sputnik? Shuttle-Mir!. The Russians and the Americans have teamed together to establish a permanent human presence in space. If you are going to have a Space Shuttle, then its gotta go someplace like a space station. And if you have a Space Station, then you need a shuttle to transport station crews. Visit the Shuttle-Mir Web Site (http://shuttle-mir.nasa.gov). "Sputnik Marked Exciting Time for Russian Scientist"
Spacemodels.com has custom built space ship models and scale replicas and they have a model of Sputnik launch vehicle (click here). In the October 1, 1997 article of the Christian Science Monitor ("A Tale Of Soviets' Secret Aim" by Peter Ford) has a interesting article about Boris Chertok, the deputy director of the ICBM project. The purpose of the R-7 rocket was to drop nuclear bombs on American cities. That rocket was the fruit of a crash program launched in 1953 by the Soviet government as it strove desperately to catch up with the United States in the arms race. Moscow had built an atom bomb, but it had no way to deliver it anywhere in America. While US strategic bombers were stationed at NATO airbases all around Soviet borders, in the mid-1950s the Soviet Air Force had no plane capable of reaching US targets and returning. As far as his colleagues were concerned, space was just enroute from Moscow to Washington for a Soviet nuclear bomb. Mr. Sergei Korolev, however, had raised the prospect of a satellite launch in a secret memo to the Soviet government in 1954. He had been given the go-ahead to set up a team to build one. The satellite team, working on an ambitious 3,000-pound apparatus packed with scientific instruments, was behind schedule. Korolev had a brilliant idea. 'We'll make a simple satellite ourselves.' And in just two months our plant made the world's first artificial satellite." Chertok was stunned by the effect of the news. "We thought the satellite was just a simple thing: what mattered to us was to test the rocket again to gather statistics on how its systems were functioning. And suddenly the whole world was abuzz. It was only later that we understood what we had done." Chertok said that Baikonur, the Soviet Cape Canaveral, was "a terrible piece of barren steppe," he remembers, where summer temperatures could reach 122 degrees F., where the scientists and mechanics lived in railway cars, and where there was so little natural water they sometimes washed in bottled mineral water. "Unpublished Drawings" of the R7 rocket that put Sputnik into orbit is available at the Saturn Press website at http://members.aol.com/satrnpress/saturn.htm. Saturn Press specializes in rocketry publications, offering a complete line of products for modelers and space enthusiasts. The Sputnik replica, built by French and Russian teenagers, died after two months in orbit. It was hand-launched from Mir in November 3, 1997 and the batteries were expected to last no more than two months. Its transmission frequency was 145.820 MHz which provided the opportunity for many around the world hear the "beep-beep-beep" transmissions from this replica of Sputnik, just like listeners did with the original Sputnik in the 1950s. However, the satellite achieved its mission objective. Built as if the teenagers followed the criteria specified by NASA Administrator Dan Goldin's "Better, Faster, Cheaper" spacecraft design philosophy, many people around the world were able to use their 2 meter ham receivers to pickup transmissions. The satellite is expected to remain in orbit for about a year (from November 1997). Sputnik replica batteries have finally been exhausted as no one has able to pickup more transmissions. The satellite is expected to re-enter the earth's atmosphere in about a year. Many people were able to pickup the transmissions even with handhelds. Reports from several places indicate the working model Sputnik PS2 satellite launched Monday, November 3, from the Mir space station is beeping away on 145.82 MHz. The one-third scale Sputnik model was built by students in Russia and France to commemorate the 40th anniversary of the original Sputnik 1 satellite. Sputnik 1, launched by the Soviet Union in 1957, was the first artificial Earth satellite. 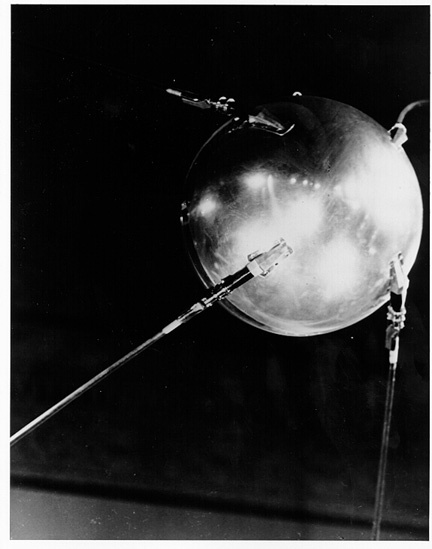 The original Sputnik 1 transmitted a beacon on approximately 20 MHz. The Sputnik model was launched by hand from Mir during a space walk by Cosmonauts Pavel Vinogradov and Anatoly Solovyev, who turned on the transmitter and checked out reception aboard Mir before launch with help from US astronaut David Wolf, KC5VPF. The beacon is audible in either FM or SSB mode. The beacon transmitter runs approximately 250 mW. Several stations have reported hearing Sputnik PS2 on the nominal frequency of 145.82 MHz, Doppler shift giving slighty higher frequency on acquisition of signal, and slightly lower at loss of signal. The signal is reportedly clearly audible even on a hand-held. On Reunion Island, a great cheer went up as hams, students and teachers gathered to listen to the Sputnik model as it passed overhead on its initial orbit and heard the beacon signal from space for the first time. Students from the FR5KJ radio club at Jules Reydellet College in St Denis, Reunion Island, and at the Polytechnic Laboratory of Nalchik Kabardine in Russia cooperated in building the mini-Sputnik. The Russian students built the satellite body, while the French students fabricated the transmitter inside. Two working models of the Sputnik were assembled and transported to Mir, but only one was launched. The 500 mm antennas are circularly polarized. Reception reports go to FR5KJ, the club station at College Reydellet. FR5KJ radio club will publish a diploma available for listeners. It will be numerated and authenticated by the stamp of the club. The list of diploma's owners will figure in a witness book. Diplomas will be sent after RS17 vanishing (no more signal transmission). The difference between a QSL card and a diploma : a QSL concern especially Amateur Radio. A Diploma has an idea larger of the commemoration. It addresses to people who want to keep a beautiful "memory" of the event. The format adopted 15x21cm and will be in 4 colors on special paper. For occasional listenners, they will have to indicate the call sign of the station and the operator will certify the accuracy of the contact. Diplomas will be sent after RS17 emits no more signal transmissions. Diploma request via email will be rejected. The frequency of the beacon audio indicates the satellite's internal temperature. The scale runs from 1361 Hz at 50 degrees C to 541 Hz at minus 40 degrees C.
British historian Rip Bulkeley, ripb@gn.apc.org, is researching the "surprise" aspects of Sputnik 1. He sent me a discussion and some questions about the Sputnik, including the Soviet amateur radio magazine Radio published several detailed accounts of the future sputniks, including their telemetry frequencies, of which western scientists were still largely unaware, in June thru September 1957. Click here to read his letter to me, and if you can answer his questions, then he would appreciate an answer. Near the date of October 4, 1997, there were various newspaper articles written about Sputnik and some of these are available online. These articles were found at Newsworks located at http://search.newsworks.com/addquery.html?qt=Sputnik. A slightly different input to the Newsworks using http://search.newsworks.com/addquery.html?qt=%22Sputnik%22 will yield some different articles. The following article was written ten years ago and here is where you can see the then on-going attitude that the Russians were enemies. Back then, the United States was doing everything it could to beat the Russians in space exploration. Nowdays, the United States is doing everything it can to work with the Russians in space exploration [amazing what can happen in ten years]. Another place to find articles on Sputnik is the newsgroups. Use Dejanews at http://www.dejanews.com to search for applicable postings on Sputnik. I recommend you type in Sputnik satellite for the search string, otherwise you will get lots of postings not applicable to the spacecraft. Dejanews archives EVERYTHING on ALL newsgroups, and is very useful to find subject matter of your interest instead of having to read every stinking article on the newsgroups. The Shock of the Century by Washington journalist Paul Dickson: Go to http://sputnikbook.com for an outline on this book. There are photos, introduction, and several links. Never before had so small and so harmless an object created such consternation. SPUTNIK home page (at http://sputnik.infospace.ru) is described as "dedicated to 40th anniversary of the first artificial Earth satellite launch." There is also a link to the Russian Space Monitoring Information Support laboratory (SMIS) of Space Research Institute (IKI RAN).